The Vineyard Race will be celebrating a special anniversary this year. The 80th running of the Labor Day weekend classic, hosted by Stamford Yacht Club, starts Friday, August 29. The race offers competitors a choice of options to fit every racing style and need. There will be IRC, HPR and PHRF Spinnaker, Multihull and IRC Double-handed divisions for the classic 238-nautical mile Vineyard Race course out to Buzzards Bay and back. If there are sufficient entries, a PHRF Double-handed division may be formed as well. There will be PHRF Spinnaker and Nonspinnaker divisions for the shorter Cornfield Point (116 NM) and Seaflower Reef (143 NM) courses inside Long Island Sound and may include PHRF Double-handed if there is a demand. There will also be special PHRF classic boat scoring on the Vineyard Race course for the Bounding Home Trophy. (a) All boats must have a length overall of 29 feet or longer. (b) Boats may race IRC if they have a current IRC certificate. IRC boats rating 1.080 or higher (faster) must have an Endorsed certificate. Boats racing for the Northern Ocean Racing Trophy (NORT), the Double-handed Ocean Racing Trophy (DH-ORT) and/or the Gulf Stream Series Trophy must have Endorsed certificates. (c) Boats may race PHRF for the Vineyard Race course if their PHRF rating (YRA of LIS distance rating) is 129 seconds/mile or faster. The New England Lighthouse Series (NELS) is dedicated to PHRF boats rating 90 and higher (slower). (d) Boats may race ORR if there are adequate entries to form a class or classes. (e) Boats may race HPR if they have a current HPR certificate. (f ) Boats electing the Seaflower Reef Course must have either an IRC rating between 0.880 and 1.045 or a PHRF rating from 69 to 147 (YRA of LIS distance rating). (g) Boats electing the Cornfield Point Course must have a PHRF rating from 90 to 198 (YRALIS distance rating). (h) Cruising Boats – Boats rated PHRF 123 seconds/mile or faster may sail on the Vineyard Course, with spinnaker, provided it is tacked at the stem with no longer than a 3-foot line. Spinnaker poles and bowsprits of any kind are NOT permitted. Such boats will race at their YRA-LIS Spinnaker Rating. (i) Mini 6.50 or Mini Transat Class boats with a minimum crew of two (2) are permitted. Finally, the Corinthian Challenge is back. 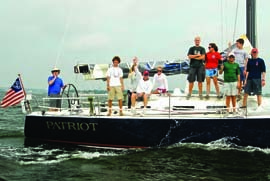 Last year’s overall winner, Patriot, sailed by the American Yacht Club Junior Big Boat Team, was a product of the Corinthian Challenge, created to encourage participation by high school and college students. Full details on the race and links to key documents and entry forms are available at stamfordyc.com, and you’ll find the Vineyard Race blog at vineyardrace.wordpress.com.